"[C]onsumers spent $1.1 trillion on gasoline and vehicles commuting to work, traveling to perform household chores and to access entertainment, and traveling for business and vacations, and spent an astronomical 175 billion hours in transit, which averages out to about 100 minutes per day for each and every American,valued at some $760 billion. Firms spent $1 trillion shipping products using their own and for-hire transportation, while the commodities that were shipped absorbed 25 billion ton-days in transit, valued at roughly $2.2 trillion. Local, state, and federal government spending on transportation infrastructure and services contributed an additional $260 billion, bringing total pecuniary spending on transportation up to 2.4 trillion, or 17 percent of GDP in 2007, which is as much as Americans spent on health care, and total annual money and time expenditures to more than $5 trillion! Finally, transportation looms large in American life because both the public and private sector have made huge investments in the transportation capital stock, which (after deducting depreciation) is valued by the U.S. Department of Commerce at nearly $4 trillion ..."
Many of these costs are not immediately apparent. After all, the transportation costs of firms are not costs that most of us see directly, but instead costs that are wrapped into the final cost of goods and services. The costs of time spent in traffic are not monetary costs. The link from transportation capital stock paid for in is government budgets and the tax revenues that ultimately support such spending is not especially clear. Cars should be charged for driving during times when traffic is congested. When you drive during a time when congestion is high, you of course experience the costs of having lots of other drivers on the road. But you also play a role in imposing those costs of time and delay on others. Most big cities charge too little for street parking, at least during peak times For economists, when street parking is all taken for blocks around, and people are cruising the streets looking for a spot, it seems clear that the quantity of parking demanded is exceeding the quantity supplied at the existing price--and so the price should rise. "The gasoline tax that truckers are charged for highway travel does not adequately account for their damage to pavements because that damage depends on a truck’s weight per axle (for a given weight, trucks with more axles inflict less pavement damage) and for their stress on bridges, which depends on a truck’s total weight." Higher charges would provide an incentive to use trucks with more axles, which would save wear and tear on roads and bridges. "The charge that an aircraft pays public airports to land (they are not charged to take off) is based on its weight and generally does not vary by time of day. But the volume of aircraft traffic, which determines the length of time that a plane must wait on the ground or in the air, does. Efficient takeoff and landing (marginal cost) congestion charges that vary by time of day could significantly reduce air travel delays, generating a $6.3 billion annual welfare gain, accounting for the time savings to travelers and reduced operating costs to airlines ..."
"[U]sers of urban bus and rail transit pay fares that are set by transit authorities below marginal cost, some even ride at discounts from those fares, and some federal employees ride free. As pointed out later, such subsidies are hard to justify on distributional grounds because transit users generally live in households with incomes that are above the national average ..."
"Most highways in major metropolitan areas operate under congested conditions during much of the day, yet highway design standards are based on free-flow travel speeds. Policymakers could therefore reduce the cost of delays by expanding the range of alternative highway designs that, for example, could raise speeds during peak travel periods by increasing the number of lanes, although speeds during off-peak travel periods may be slower because lanes and shoulder widths would be narrower. Technology exists to install lane dividers that can be illuminated so that they are visible to motorists and that can be adjusted to increase or decrease the number of lanes that are available in response to traffic volume." "[I]nvestments in highway durability—that is, pavement thickness—should minimize the sum of initial capital and ongoing maintenance costs. They determined that building roads with thicker pavement at an annualized cost of $3.7 billion would generate an annualized maintenance saving of almost 4 times as much—$14.4 billion—for a net annual welfare gain of $10.7 billion. Roads could also be made more durable by implementing innovations such as tack coats between pavement levels and thicker bottom layers of asphalt to avoid buckling, both of which can extend the functional life of a highway at little extra cost. But state departments of transportation award construction contracts on the basis of the minimum bid, not on the technological sophistication of the contractor ..."
For many economists, suggestions like these sound obvious. For many non-economists, they sound near-heretical, because they don't involve large government spending programs to pour concrete, lay railroad track, expand seaports and airports, and the like. Winston is by no means opposed to additional infrastructure spending, but he seeks to turn the conversation toward how the existing transportation grid can be used more efficiently, and how the all-too-real costs of potential infrastructure expansions can be fairly evaluated along with the potential benefits. After all, we know that government involvement in the airline industry led over many decades from the 1930s up through the 1970s to a strangling of competition, high profits for airlines, and high fares for consumers. We know that government management and ownership of many mass transit systems around the country has led to systems that are not covering even their marginal costs, and seem to require ever-higher subsidies. We know that the existing government methods of funding repair of roads and bridges has allowed many of them to fall into serious disrepair. The US transportation sector is the outcome of a large number of decisions about building and pricing, many of the them either made for short-term political reasons or just unexamined. It needs a conceptual shake-up. Back when I was in college in the late 1970s and early 1980s, it was typical to hear that women earned 59 cents for every $1 earned by men. The figure below, taken from the September 2013 Census Bureau report on "Income, Poverty, and Health Insurance Coverage in the United States: 2012," by Carmen DeNavas-Walt, Bernadette D. Proctor,and Jessica C. Smith, shows why 59 cents had such force. 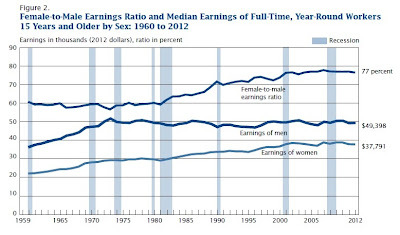 Looking back for 20 years through the 1960s and the 1970s, the ratio of median earnings for a full-time female work to that of a full-time male worker had hovered at around 59 cents--despite what seemed to be enormous changes in the role of women in the workforce during this time. A standard explanation for the seeming stability of the 59 cents during the 1960s and 1970s was that there were two opposing patterns at work as women entered the paid workforce in large numbers. 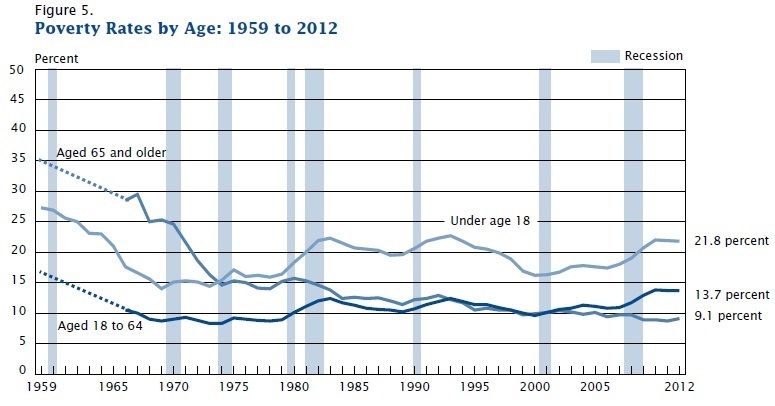 The labor force participation rate for women rose from 38% in 1960 to about 51% by 1980. Many women were gaining experience and credentials in the paid workforce, which should have tended to push up the ratio of female/male wages, but many of the women who were entering the paid workforce for the first time were taking low-paid entry-level jobs, which tended to pull down the ratio of female/male wages. During the 1960s and 1970s, these factors largely offset each other. I can report that this argument was not a popular one for a male economics major to make during his college days in the early 1980s. (And yes, I was careful to point out that the story of counterbalancing forces had no particular implication for how much gender discrimination continued to exist.) But the story did have a testable implication: after the process of women entering the paid workforce for the first time had largely run its course, then the effect of women having more experience and credentials should dominate and the female/male wage ratio would rise. Indeed, the female/male earnings ratio did start rising right around 1980, and now stands at 77%. Thus, the good news in terms of pay equity is that at least it's still not 59 cents for every $1. The ongoing issue is how to explain the remaining wage gap, and there's considerable controversy on this point. For example, if one adjusts for the industry in which people work, or the kinds of jobs they do, the female/male wage gap looks smaller. But what if those industries and jobs and the pay levels in those industries and job choices are themselves, at least to some extent, the result of patterns of unequal treatment by gender? It does seem clear that a substantial share of the remaining gender gap is due to women's taking a greater share of responsibility for children in particular. For example, here's a 1998 article by Jane Waldfogel in the Journal of Economic Perspectives (where I've been the managing editor since 1987) looking at this "family gap." Of course, this then leads to an argument over the extent to which women are choosing these responsibilities and the extent to which these responsibilities are being forced upon them. Perhaps scarred by my college exposure to these issues, I'll duck that question here, and just note that other countries have far more extensive parental leave rules than does the United States. The evidence on the female/male wage gap seems consistent with an overall pattern that outright discrimination by employers in labor markets has diminished, and today the larger reason underlying the female/male wage gap are social expectations and pressures from both men and women about industry and job choices, and about how the tasks of child-raising will be divided. 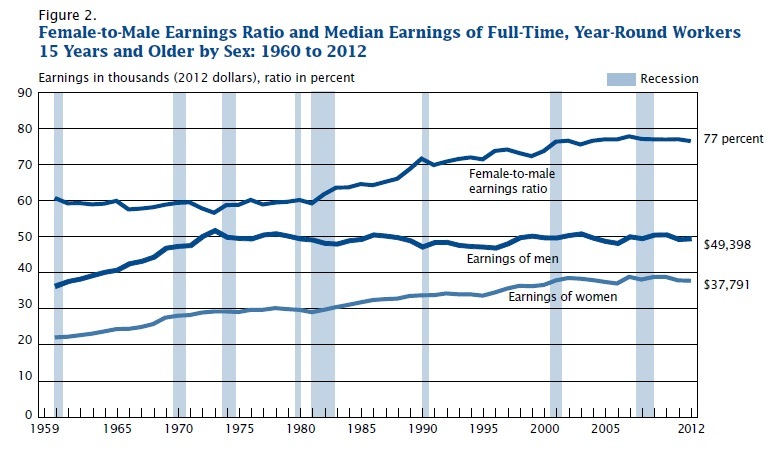 One statistical note here: The figure shows the ratio of median wages, not average wages. For the uninitiated, the median is the number where half have more and half have less. If those at the top of the income distribution get more, while everyone else remains the same, then the average income level will rise, but the median will not. The median is often more useful for getting a sense of the "typical" worker in the middle of the overall income distribution, which is why it is used here, but it would be incorrect to look at the median and conclude that average wages have not risen. Indeed, I assume that men substantially outnumber in the top 1% or the top 10% of the earning distribution, and so the focus here on median earnings will in that way understate the amount of gender inequality remaining. A couple of years ago, I found myself standing in a grocery store in Boston, waiting for the person behind the counter to make me a cheesesteak hoagie. I noticed that I was near the meat section of the grocery, and as a Minnesota person, I wandered over to sightsee the seafood. The seafood was quite reasonably priced by Midwestern standards, but when I looked more closely at the labels, the scallops and shrimp and a lot of the fish it had been imported from China and the far East. "Before it became associated with corporate behemoths like Amazon, Boeing, Microsoft and Starbucks, as well as the cultural phenomenon that was grunge music, the US state of Washington was famous for its apples. To some irate state residents though, it appeared that only the small and old-looking ones remained in the state, while all the red and delicious apples were being shipped out of state. To the state residents who wrote to their local newspaper the Seattle Times expressing their disappointment, it was a mystery that had no obvious explanation. This thesis has been good fodder for argument ever since. For example, good restaurants in Boston do have excellent lobsters. Borcherding and Silberberg argued that this tends to support the Alchian and Allen hypothesis, because "it does not matter if the goods are shipped to the consumers or the consumers are shipped to the goods." The key distinction here is whether natives and those buying at roadside stands or local groceries typically end up with lower-quality lobsters than those eating at restaurants that cater to tourists. If you're interested in delving into the more recent research literature here, a useful starting point is the paper by David Hummels and Alexandre Skiba, "An Empirical Confirmation of the Alchian‐Allen Conjecture," published in the December 2004 issue of the Journal of Political Economy (112:6, pp. 1384-1404). I've posted a couple of times recently about the fact that the labor share of total income has declined in recent years, both in the U.S. economy and around the world. But interest in the topic seems strong, and there's an intriguing new paper out on "The Decline of the U.S. Labor Share," by Michael Elsby, Bart Hobijn, and Ayşegül Șahin in the latest issue of the Brookings Papers on Economic Activity. Here, I'll list some of the overall themes that come up both in this paper and in previous posts, together with new insights from this paper. 1) The fall in labor share of national income in the last couple decades is quite a remarkable change, because for most of the 20th century, the labor share of national income could be thought of as pretty much a constant. Back in 1939, John Maynard Keynes was writing that the “remarkable constancy” of the aggregate labor share is “a bit of a miracle.” Paul Samuelson made a similar comment in a 1949 article. Nicholas Kaldor documented a similar result in the late 1950s. When I was first learning economics in the late 1970s and early 1980s, the labor share of national income was typically viewed as more-or-less constant, with some variation over the business cycle Indeed, I spent a certain proportion of time in my college years pointing out that the facts at that time did not support the claim that capital was receiving an ever-greater share of national income. 2) The seeming consistency of the labor share of national income up until the mid-1980s was actually the result of trends that counterbalanced each other. The shift from manufacturing to services tended to push down the labor share over time, but the growth of the health care industry tended to push up the labor share over tiem. 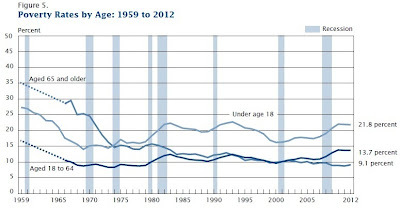 3) The decline in labor share is not the same as the rise in inequality of incomes. All of labor income is included in labor share, including what is earned by the top 1% as compensation for labor. Elsby, Hobijn, and Șahin write: "[T]he labor share in the United States has in fact been buoyed up increasingly by the rising income shares of very rich workers, like CEOs for example. Thus, the decline in the labor share conceals, rather than exposes, most of the large increases in inequality that have emerged in recent decades." 4) The decline in the labor share of national income is occurring, but is also probably overstated in the commonly used statistics. 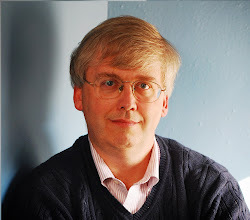 Elsby, Hobijn, and Șahin point out that the usual statistical approach has no easy way of estimating the income of those who are self-employed, and as a result an assumption buried in the data is to assume that the hourly compensation of payroll employees and the self-employed has changed in the same way over time. However, they believe that the pay of the self-employed has probably increased in the last couple of decades relative to the pay of payroll employees, and so the labor share is a little greater than the official statistics show. They find that "around a third of the decline in the headline measure is a symptom of the method used to impute self-employment income." 5) One potential explanation for the declining labor share is that an increased rate of capital investment substituted for labor. However, Elsby, Hobijn, and Șahin find that the evidence does not support this explanation; specifically, the amount of capital/output wasn't rising over this time. 6) Another possible explanation for declining labor share is the decline in private-sector unionization rates in recent decades. owever, Elsby, Hobijn, and Șahin find that the evidence does not support this explanation; specifically, the fall in labor share across industries doesn't seem much correlated with the changes in unionization rates in those industries. 7) Yet another possible explanation for the declining labor share is increased global competition. Elsby, Hobijn, and Șahin write: "Our analysis identifies offshoring of the labor-intensive part of the U.S supply chain as a leading potential explanation for the decline in the labor share." More specifically, they document a close connection between which industries are exposed to greater import competition and which industries saw the biggest fall in labor share during the last 25 years or so. The slow phase-in of the Patient Protection and Affordable Care Act of 2010, widely known as "Obamacare," is supposed to kick into a higher gear on October 1 when open enrollment begins in the "exchanges" that are one of the tools for expanding the share of the U.S. population with health insurance. As law comes into effect, it's perhaps useful to take a step back from the day-to-day kerfuffles over the mechanics of implementation and look at the big picture. Why was it so widely perceived that a major reform of the U.S health care sector was needed? There have been two main concerns about the U.S. health care sector for the last few decades. First, tens of millions of Americans lacked health insurance, which in turn raised concerns that they were receiving too little health care, or receiving it too late, or receiving it at costs that led to severe household financial stress. Second, the cost of health care had been rising faster than the size of the U.S. economy for decades. In the private sector, firms paying more for health insurance meant that less money was available for raises in take-home pay. In the public sector, the rising costs of Medicare, Medicaid, and health care costs for retired government workers were creating pressure in all the other parts of public budgets. Sure, there were other concerns about the health care sector, like making health insurance companies play nice, or providing support for medical education and biomedical research. But addressing those sorts of concerns didn't require sweeping legislation to shake up the health care sector. How is the Affordable Care Act likely to perform on the two main issues of covering the uninsured and constraining the rise in costs? Since well before the passage of the Act, it has been clear that it would not provide universal health insurance coverage. For example,here's a White House announcement in September 2010 predicting that the act would reduce the number of Americans without health insurance from about 50 million to about 18 million. The Congressional Budget Office estimated last spring that the implementation of the Affordable Care Act would reduce the number of Americans without health insurance from 55 million in 2013 to 31 million in 2016, with most of that drop coming from people signing up for the new insurance "exchanges" and some coming from an expansion of Medicaid. But by 2023, there would still be 31 million uninsured. Here's a recent Washington Post story about those 31 million. So after all the tumult and the shouting over the Affordable Care Act, both, during and after its passage, its supporters optimistically expected it to solve about 60% of the problem of Americans lacking health insurance, and in fact it now seems likely to solve about 40% of that problem. On the subject of restraining the rise in health care costs, the bottom line is that when a piece of legislation is promising to expand substantially the amount of health care that people will be able to consume, it is going to increase costs, at least in the short run. Again, this was openly admitted by those who advocated the act. Their argument was that although health care costs would rise in the short run, various cost-controls built into the legislation would help constrain the rise in costs in the longer run. As one example of such claims, here's Jonathan Gruber making this case in 2010 in the New England Journal of Medicine. But while the Affordable Care Act does include many pilot projects and experiments that seek to hold down health care costs, the effect of these projects is not yet known. But not much is known along these lines so far. As a report earlier this summer from the Institute of Medicine at the National Academy of Sciences reports, "the ACA [Affordable Care Act] generated a thousand pilot demonstrations of new payment models. It is too early to know which of these models will prove to control health care costs and improve quality." cost of higher premiums in the form of lower wages." Thus, even with the recent slowdown in health care costs taken into account, the most recent Congressional Budget Office report looked at future health care costs this way: "Although the growth of health care spending has slowed recently, CBO projects that spending per enrollee in federal health care programs will continue to increase at a faster pace than per capita GDP. However, the difference between those two growth rates will be smaller than its average of recent decades, CBO projects." Here are the estimates from the CBO projecting continued rapid growth in federal spending on health care programs as a share of GDP. In short, the Patient Protection and Affordable Care Act is going to be only a partial success in expanding health insurance coverage and in constraining the rise in health care costs. As this reality becomes clear, the fallback case for supporting the legislation, and the disruption and uncertainty that it is creating, is that something needed to be done, the law was at least a partial step in the right direction, and because of political opposition from the Republicans, this plan was the only one on offer. This defense seems to me disingenuous. Yes, something needed to be done. But the Affordable Care Act was not the only health care proposal floating about. Indeed, President George W. Bush proposed a far-reaching health care reform in his State of the Union address back in 2007, and the Democrats who controlled Congress at that time were emphatically not willing to accept the argument that something needed to be done and it was at least a partial step in the right direction. Families With Health Insurance Will Not Pay Income Or Payroll Taxes On The First $15,000 In Compensation And Singles Will Not Pay Income Or Payroll Taxes On The First $7,500. The notion of Bush's was that treating health insurance as taxable income, while providing a limited the deduction, would tend to put downward pressure on more expensive "Cadillac" insurance plans. It would also mean that those who get insurance through an employer would not be favored over those who need to buy their own insurance. In addition, Bush's plan included a planned reallocation of federal income to states, so that states could subsidize health insurance for those with low incomes. At least by some admittedly partisan estimates, Bush's plan could have outperformed what the Affordable Care Act is likely to achieve in terms of reducing the number of uninsured and slowing the growth of health care costs. Here's an overview of what happened with the Bush proposal, which garnered supportive comments from some unexpected places like the Urban Institute and the Washington Post editorial board, but was pronounced "dead on arrival" by Congressional Democrats. My point isn't to carry water for the Bush plan, which had its own set of issues, and probably would have had even more issues if it has been masticated by Congress. My point is that political obstruction on health care policy is a bipartisan habit. But for better or worse, America's efforts to reform its health reform system are in fact beginning with the Patient Protection and Affordable Care Act. Additional health care legislation is virtually certain to be needed; indeed, the air is already thick with waivers and missed and postponed timelines. My hope is that at least some supporters of the bill can admit that parts of it badly need changing or even expunging, and at least some opponents can admit that parts of it are worth keeping. I sometimes struggle when teaching about unemployment to explain just why work matters. It's straightforward enough in class about economics to note that elevated unemployment leads to loss of economic output, lower tax payments, and greater need for government welfare benefits. I can refer to evidence on how unemployment is connected to social ills like bankruptcy, divorce, depression, and even suicide. But this listing of consequences, while a necessary part of teaching the economics of unemployment, doesn't touch the human heart of the issue. The poet Marge Piercy, in her 1973 poem "To be of use," gives a more concise and powerful sense of why useful work matters so much. Each September, the U.S. Census Bureau releases its annual estimates of the U.S. poverty rate, and even when the news isn't worse, it's hasn't been good for a long time. 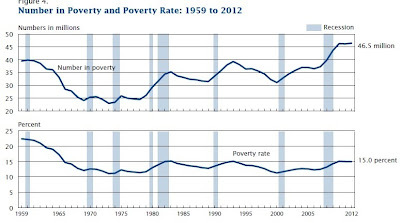 The essential problem, as shown in the figure below, is not so much that the poverty rate bumped up during the Great Recession, bur rather that the official poverty rates has been stuck at about the same level of about 13-15% since the early 1980s. 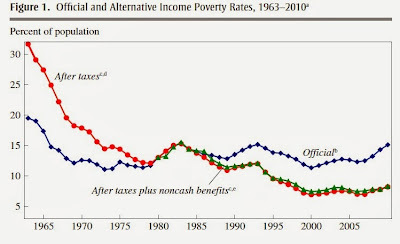 This pattern would seem to require endorsing some combination of the following dispiriting views: either government anti-poverty policies are ineffective in reducing poverty, or any effectiveness of anti-poverty programs in reducing poverty is being counterbalanced by other economic or demographic factors that are creating an offsetting rise in poverty. However, in a paper published in the Fall 2012 issue of the Brookings Papers on Economic Activity, Bruce D. Meyer and James X. Sullivan present some alternative interpretations and more cheerful conclusions in "Winning the War: Poverty from the Great Society to the Great Recession." They conclude: "Despite repeated claims of a failed war on poverty, our results show that the combination of targeted economic policies and policies that support growth has had a significant impact on poverty. ... Noticeable improvements have been made in the last decade; although not as big as the improvements in some earlier decades, they are comparable to or better than the progress made in the 1980s. We may not yet have won the war on poverty, but we are certainly winning." the Consumer Price Index (CPI-U)." Meyer and Sullivan offer a number of different ways of adjusting these official poverty measures. For example, many low-income people receive support through the Earned Income Tax Credit, which isn't counted in the official poverty line, as well as getting support from food stamps, Medicaid, and other programs. Economists have also long argued that the Consumer Price Index overstates the true rise in the standard of living (for example, by not adequately taking new goods and inventions into account), and so by increasing the poverty line each year using the CPI inflation rate, the poverty line actually is creeping a little higher in terms of actual standard of living each year. This effect is quite small in any single year, but over the last half-century, it adds up. Here's one of their illustrative calculations. The official poverty line is in blue. They then calculated income in a way that included taxes and the value of noncash benefits. They set up the calculation so that the two measures would have the same poverty rate in 1980, and then adjusted the poverty rate over time using the inflation rate. But when after-tax income is used in the calculation, the poverty rate falls more sharply over time, including during the last 30 years. But perhaps their most striking result uses data on consumption, rather than data on income, to calculate the change in poverty rates over time. Consumption data comes from a different national survey than does income data (the Current Expenditure Survey rather than the Current Population Survey). Meyer and Sullivan point out that at the bottom of the income distribution, the answers about income on the Current Population Survey clearly understate the amount of income received. For example, only about half of welfare payments seem to be reported in the Current Population Survey. The proportion of economic activity that goes unreported to the tax authorities--and to the government survey--is probably higher at the bottom of the income distribution, too. In addition, when we talk about poverty what we are really worried about is more accurately captured by consumption rather than by income. 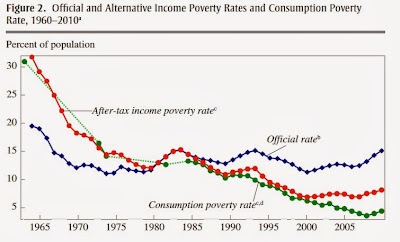 Meyer and Sullivan used consumption data, and again they set up the calculation so that the poverty rate for consumption data is the same as the poverty rate for income data as of 1980. 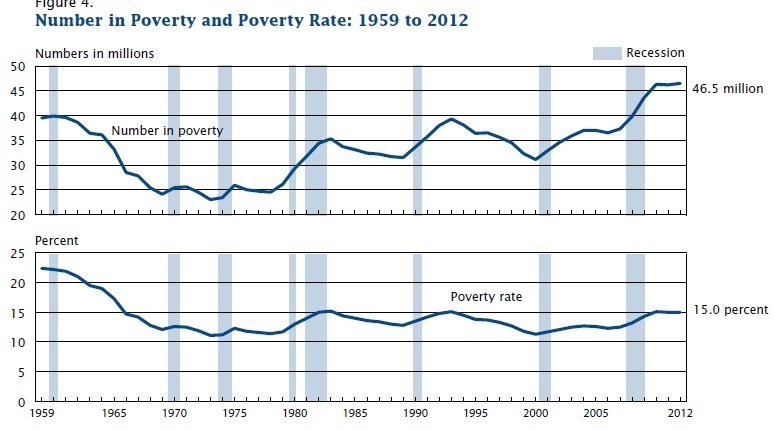 Again, the blue line shows trhe official poverty rate. 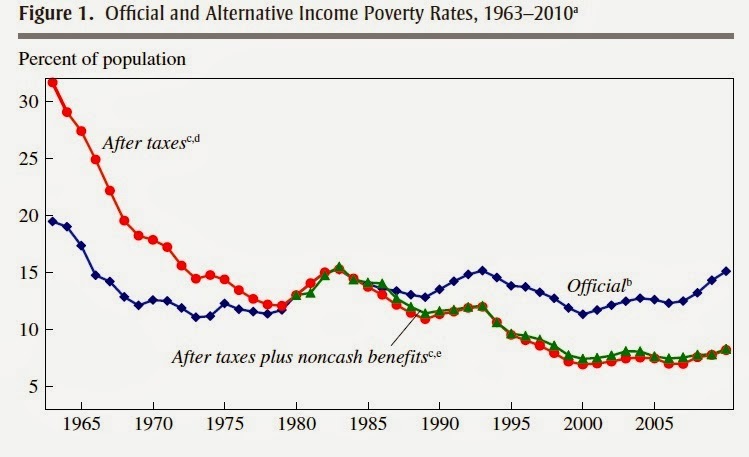 The red line shows the poverty rate with a broader definition of income, adjusted for after-tax income. 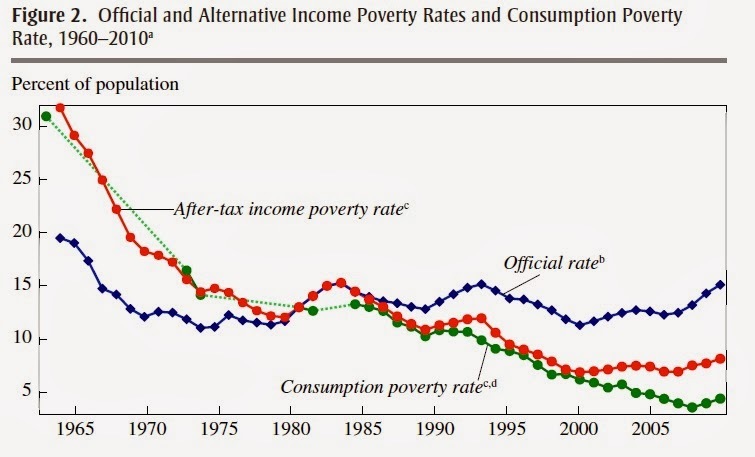 The green line shows the change in the poverty rate if consumption is used to measure poverty. By this measure, the poverty rate almost reaches zero percent in 2007, before the Great Recession. Thus, they write: "The results in this paper contradict the claim that poverty has shown little improvement over time and that antipoverty efforts have been ineffective. We show that moving from traditional income-based measures of poverty to a consumption-based measure, which is arguably superior on both theoretical and practical grounds—and, crucially, accounting for bias in the cost-of-living adjustment—leads to the conclusion that the poverty rate declined by 26.4 percentage points between 1960 and 2010, with 8.5 percentage points of that decline occurring since 1980." My go-to source for budget deficit projections is the Congressional Budget Office, which has just released "The 2013 Long-Run Budget Outlook." 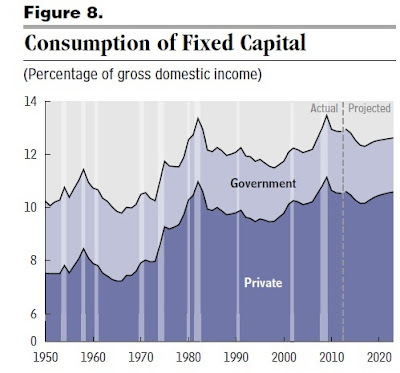 Here's the long-run overview in one diagram, showing federal debt held by the public a a share of GDP during the history of the United States--and projected into the future. The figure illustrates a few overall patterns worth remembering. 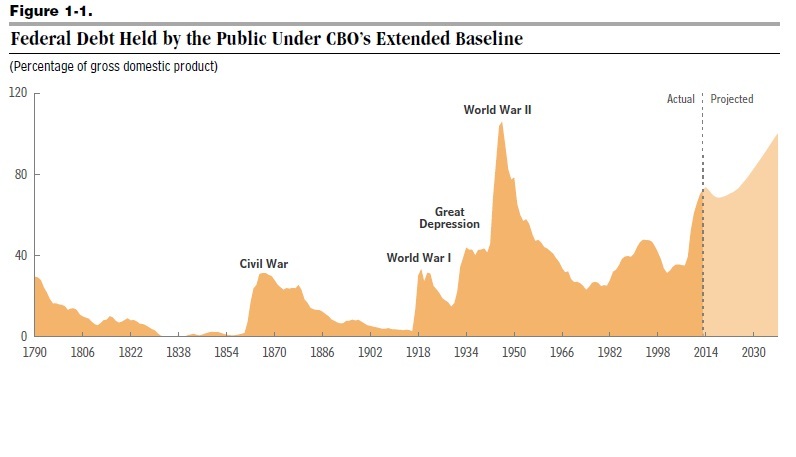 First, through most of U.S. history, spikes in the ratio of federal debt/GDP were related to wars: the Revolutionary War, Civil War, World War I, and World War II. Before the last few years, there were two other bumps in the debt/GDP ratio. One was the Great Depression. The other was the deficits of the 1980s. 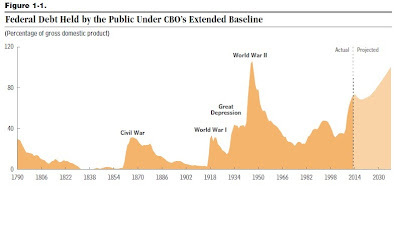 Second, the run-up in federal debt during the Great Depression and its aftermath has been quite steep, and the level of debt/GDP ratio we have reached has been exceeded in U.S. history only during World War II. Of course, these facts do not make a case that the deficits of the last few years were improper public policy; indeed, given the depth of the Great Recession, it seems to me that large federal deficits for a few years were an appropriate response (although I have my disagreements with the specific spending and tax choices that were made). But the recession ended four years ago in June 2009. The pattern historical data, and the projections, do suggest that the federal debt is on a trajectory that makes it a legitimate reason for concern. At several places, the CBO report rehearses the four main arguments for why a rising debt/GDP ratio can have negative effects. First, when the government borrows heavily, it can mean less financial capital available for private investment. Second, heavily government borrowing leads to high interest payments, which put pressure on the rest of the budget. Third, running high deficits now reduces the flexibility of the government to use high budget deficits in the future. (I sometime say: "The federal government can afford the big budget deficits associated with one Great Recession, but I'm not sure it can afford to pay for a second one.) Fourth, if the borrowing becomes very large indeed, there is a heightened risk of a financial runs and crisis. The CBO report is full of details about the rationale behind its underlying "baseline" projections for all the different categories of federal spending and taxes. The main difficulty with the "baseline" projections (which are the ones shown above) is that they are based on the assumption that everything in current law will happen. However, Congress has become astute at gaming these projections, by inserting deficit cuts that are scheduled to take place in the future like cuts in the Medicare program to physician payment, and thus make the baseline debt projections appear lower, but then these cuts don't actually take place when the time comes. Thus, the CBO also looks at an alternative fiscal scenario that seems to me more realistic. This "extended alternative fiscal scenario" assumes "that the automatic reductions in spending required by the Budget Control Act for 2014 and later will not occur (although the original caps on discretionary appropriations in that law are assumed to remain in place); that lawmakers will act to prevent Medicare’s payment rates for physicians from declining; that after 2023, lawmakers will not allow various restraints on the growth of Medicare costs and health insurance subsidies to exert their full effect; and that after 2023, federal spending for programs other than Social Security and the major health care programs will rise to its average percentage of GDP during the past two decades, rather than fall significantly below that level, as it does in the extended baseline." would reach 190 percent of GDP in 2038—compared with 108 percent of GDP under the extended baseline ..." These estimates are based on a model that reflects how the higher deficits will slow down the economy. According to the CBO central estimates: "when the deficit goes up by $1, private saving rises by 43 cents (so national saving falls by 57 cents), and foreign capital inflows rise by 24 cents, ultimately leaving a decline of 33 cents in investment ..."
The U.S. budget deficits are not some Sword of Damocles, hanging by a thread over the U.S. economy. Instead, they more resemble water erosion digging away at the base of a riverbank and making the land above unstable, or the process of aging and metal fatigue that eventually makes a bridge unsafe. The costs of sustained excessive government borrowing sneak up over time. "High-income parents talk with their school-aged children for three hours more per week than low-income parents, according to research by Meredith Phillips of UCLA.They also provide around four-and-a-half extra hours per week of time in novel or stimulating places, such as parks or churches, for their infants and toddlers. Less-advantaged parents are struggling to make a living and often lack a partner to help them build better lives. Less money typically means more stress, tougher neighborhoods, and fewer choices. 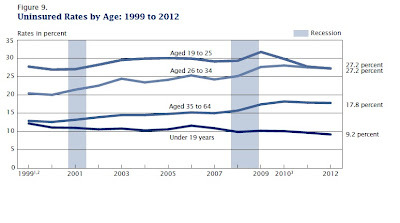 This is not to say that there has been a deterioration in parental investment in poorer families. In fact, parents without a high-school diploma spent more than twice as much time each day with their children in the 2000s than they did in the mid-1970s, according to data from the American Heritage Time Use Study, marshaled by Harvard’s Robert Putnam. But parents with at least a bachelor’s degree increased their investment of time more than fourfold over the same period, opening up a gap in time spent with kids, especially in the preschool years. The quality of time matters as much as the quantity of time, of course. In a famous study from the mid-1990s, Betty Hart and Todd R. Risley from the University of Kansas found large gaps in the amount of conversation by social and economic background. Children in families on welfare heard about 600 words per hour, working-class children heard 1,200 words, while children from professional families heard 2,100 words. By the age of three, Hart and Risley estimated, a poor child would have heard 30 million fewer words at home than one from a professional family. .... Our analysis suggests that the biggest gaps are not between the helicopter parents at the top and ordinary families in the middle, but between the middle and the bottom. " The effects of different qualities of parenting are apparent early in life. "Gaps in cognitive ability by income background open up early in life, according to research by Tamara Halle and her colleagues at Child Trends, a non-profit research center focused on children and youth. Children in families with incomes lower than 200 percent of the federal poverty line score, on average, one-fifth of a standard deviation below higher-income children on the standard Bayley Cognitive Assessment at nine months—but more than half a standard deviation below higher-income peers at two years. This is the social science equivalent of the difference between a gully and a valley. These early months are critical for developing skills in language and reasoning—and, of course, months in which parents play the most important role. Closing ability gaps in the first two years of life—pre-pre-K, if you like—means, by definition, closing the parenting gap. ... Research to date suggests that parenting accounts for around one-third of the gaps in development ..."
As the authors point out, public policy about parenting is an ideological hot potato. Conservatives tend to be comfortable with judging some parenting as low quality, but uncomfortable with enacting any public policy to change the situation. Liberals are in theory more comfortable enacting policies to help low-income children, but are often so deeply uncomfortable with making any judgments about the quality of parenting that they prefer to advocate policies like government support of preschool, or assistance with income and jobs for those in need. The authors are also brutally honest that the evidence for the effectiveness of public policy in this area is not strong: "Let us be blunt: The evidence, in fact, is that many attempts to use tax dollars to improve parenting have failed to show significant effects. In particular, it is hard to find evaluations providing strong evidence that outcomes for the children are permanently influenced—surely the ultimate objective." However, they also point out that other countries like Netherlands and the United Kingdom have much more active programs of home visitation for parents of newborns. In the U.S., the Affordable Care Act passed in 2010 allocates $1.5 billion over five years for increased home visitation programs. Studies by the Department of Human Services have identified several home visitation programs that had some effect at least one year after enrollment. A private organization called the Nurse Family Partnership has been testing and expanding approached to home visitation for several decades. Under these kinds of programs, new parents and parents of pre-school children might receive biweekly home visits invitations to regular meeting groups of new parents, and perhaps also some access to educational books and toys. Again, the evidence about long-term efficacy of such programs, especially at a large scale, is still in a nascent stage. But these authors offer a radical thought: It may well be true that the government should reallocate a substantial share of the money that it currently spends on preschool programs and move it toward parental visit programs for families with very young children. Reeves, Sawhill, and Howard write: "Parents influence their child’s fortunes right from their first breath, while pre-K is aimed at 4-year-olds. In child-development terms, four years is an eon. By the time pre-K kicks in, big differentials in test scores are already apparent. ... In the last five years, the federal government has allocated $37.5 billion to Head Start—25 times as much as promised to home-visiting programs over the next five. This may not be the optimum ratio in terms of promoting greater mobility and opportunity. ..."
the future of world trade," which in a number of ways turns out to be factors that will shape the future of the world economy as a whole. Here are some of the facts and themes that jumped out at me. 1) International trade plays a growing role in the world economy. 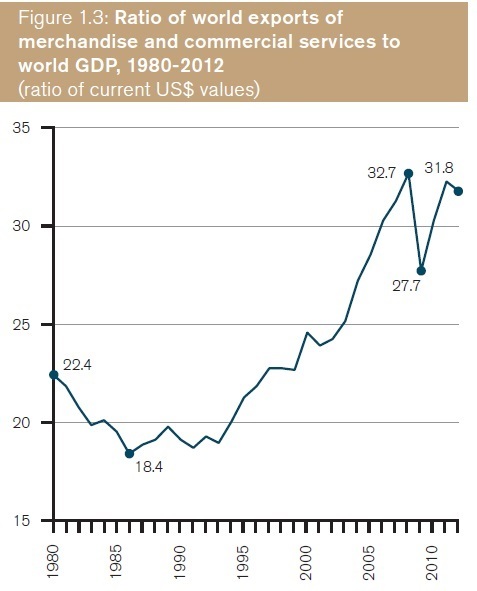 Here's a figure showing the ratio of world exports of goods and services to world GDP. 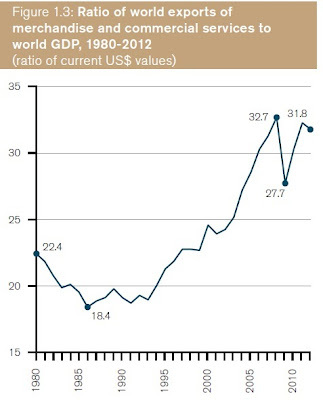 Trade rose sharply from less than one-fifth of world GDP in the mid-1980s to nearly one-third of world GDP in 2012--and world trade seems to have largely recovered from the dip during the Great Recession. 2) The rise is trade is primarily a rise in manufacturing trade. At least so far, services trade is growing in synch with overall trade, but most trade still involves manufacturing. 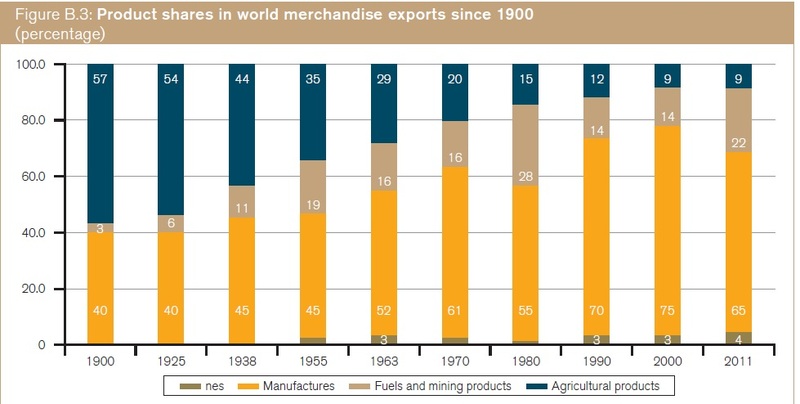 The first figure shows the growth of manufacturing trade relative to agriculture and fuel/minerals. Perhaps at some point in the future, trade in services in the global economy will grow more rapidly than goods. But at least so far, this isn't true. In particular, the graph on the right shows the share of services in overall trade of goods and services, and it's not budging much. 3) Global manufacturing trade is mostly carried out by a small number of transnational corporations that often make direct investment in other countries as part of building global supply chains in which products are increasing produced in multiple stages across countries. 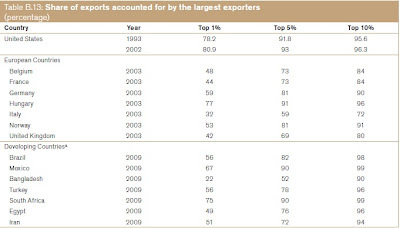 suppliers – underlining the growing importance of global supply chains ... Manufacturing is increasingly managed through complex global supply chains – effectively world factories – which locate various stages of the production process in the world’s most cost-efficient locations ..."
Here's a table showing the share of exports from various countries that are accounted for by the largest exporters. 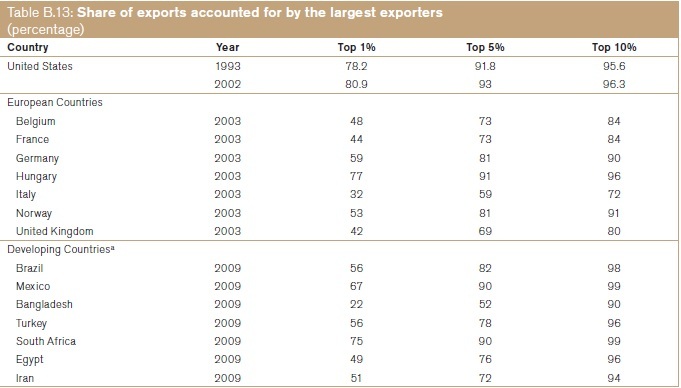 For example, in the US economy, the top 1% of exporters account for 80% of all exports. In developing countries, a common pattern is that the top five exporting firms do about about 80% of the country's exports. 4) The broad currents of world trade have shifted. 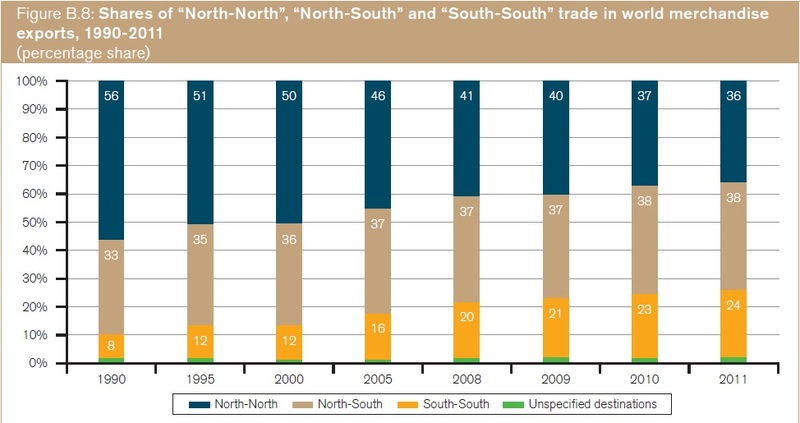 Three decades ago, the majority of world trade was North-North--that is, it was trade between high-income countries of the world. 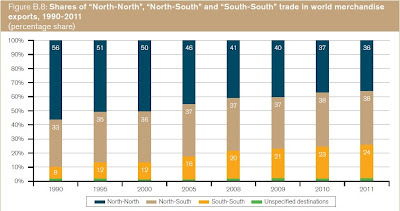 Now, only about one-third of world trade is North-North, and the share that is North-South and South-South is expanding rapidly. 5) For decades after the late 1940s, the political focus of efforts to increase world trade looked at how to reduce tariffs. But that effort has been so successful that the more important trade barriers today are nontariff barriers, and how to reduce costs of transportation. The report cites evidence that "transportation costs represent a greater barrier to trade than policy-induced obstacles, such as tariffs. At a price of US$ 100 per barrel of oil, they estimate transportation costs to be equivalent to an average tariff of 9 per cent, nearly double the WTO’s estimate of the average applied tariff." Transportation and communications infrastructure are likely to be especially important in building ties from the less-developed economies of the world to the global economy. For example, the report cites evidence that the continent of Africa has fewer kilometers of road now than it did several decades ago. 6) Many countries have seen increasing remittances from migrants. "Officially recorded migrant remittances to developing countries, estimated at US$ 406 billion in 2012, are now more than three times the size of ODA [official development assistance--aka, "foreign aid"]. Compared with other private capital flows, remittances have showed remarkable resilience during the recent financial crisis." 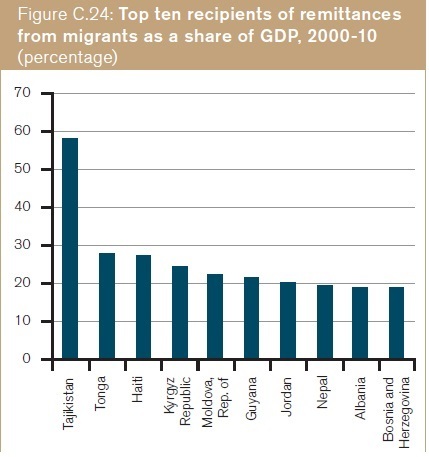 Here's list of some of the countries where the level of remittances is equal to 20% or more of GDP. 7) Comparative advantage has become more fluid. Classroom examples of the drivers of international trade tend to dwell on how identifiable products like cars and computers and oil and wheat are traded between countries, and how the key driver of trade is that it is relatively cheaper (in an opportunity cost sense) to produce certain goods in one country than in another. But with the changes in world trade, these sorts of examples do a less good job of representing what trade actually happens and what determines that trade. In a world economy where trade involves a supply chain of partially-completed intermediate goods, looking at examples of completed goods like cars and computers will miss some of the point. The locations of production will be determined by choices made by a relatively few large exporters about global production chains, and by their decisions about foreign direct investment. In turn, these decisions will be shaped by local investments in transportation and communications infrastructure, and in the other institutional, legal, and human capital support that a local economy can give to an international producer. These sorts of advantages are less related to wages, productivity, and natural resources in a static sense than in the common textbook examples. Instead, this is a sort of flexible comparative advantage that will often shift and change. Medicare is same insurance program across the country. Everyone across the country pays the same taxes to support Medicare and the elderly across the country pay the same premiums. 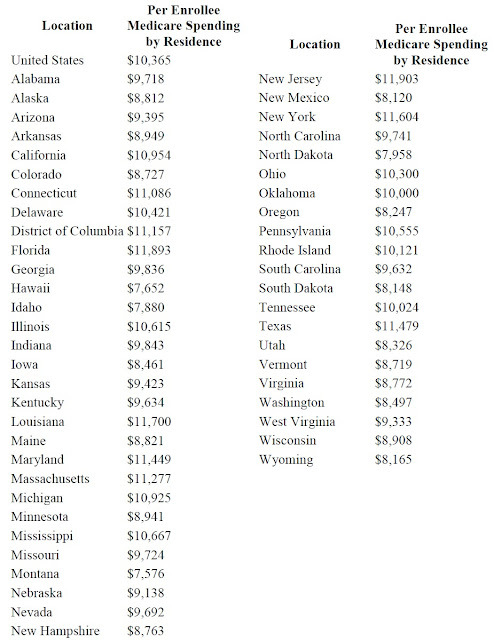 But Medicare spending per enrollee varies considerably across states. 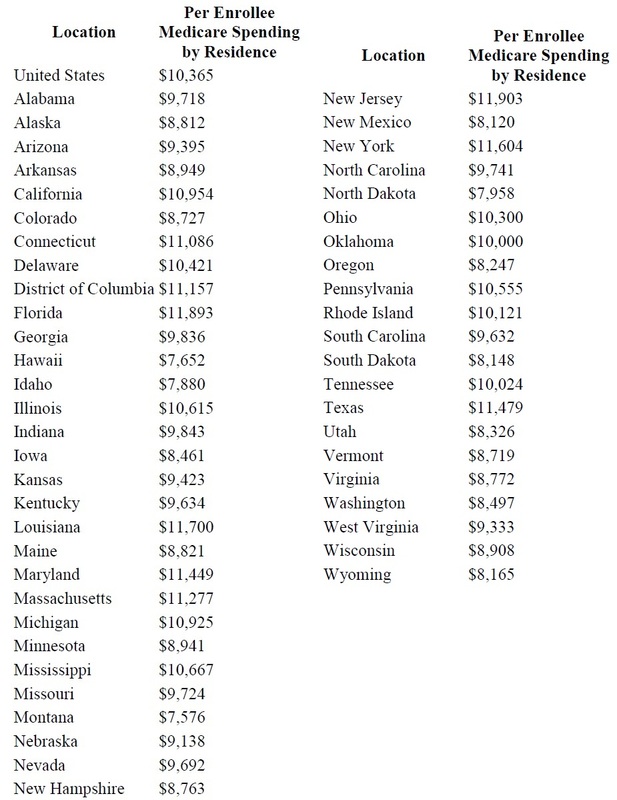 Here's a table from the Kaiser Family Foundation showing spending per Medicare enrollee by state of residence, using data from the Center for Medicare and Medicaid Services. Some states like Florida, Illinois, Louisiana, and Texas have average spending per Medicare enrollee more than 10% above the national average; a number of others, like Hawaii, Montana, and Idaho have spending more than 10% below the national average. This well-known leads to some obvious questions: Can these differences in spending can be accounted for by differences in age, income, health status, or variations in the cost of health care across regions? Joseph P. Newhouse, Alan M. Garber, Robin P. Graham, Margaret A. McCoy, Michelle Mancher, and Ashna Kibria discuss the evidence on this question in "Variation in Health Care Spending: Target Decision Making, Not Geography," published by the Institute of Medicine (a part of the National Academy of Sciences) in July. The report can be read for free on-line, and the prepublication galleys can be downloaded here. quintile. Medicare service use (adjusted for demographics and beneficiary health) is approximately 30 percent greater in the highest quintile compared with the lowest ..."
The report also looks at variation across hospital referral areas (HRRs) after adjusting for patient demographics, health status, and also for the costs of health care inputs in that area. After these adjustments, here is a bar graph ranking the HRRs from lowest montly cost (Rochester, NY) to highest (Miami, Florida). 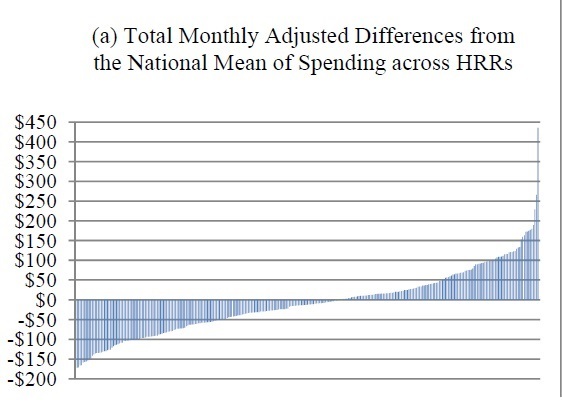 They write: "Areas to the far left in Figure 2-5a have utilization roughly $50 to $150 below the adjusted national mean, whereas those on the far right have utilization roughly $100 to $200 above the adjusted national mean." A close look at the underlying spending patterns reveals that 73% of this variation across the geographic areas is due to a single category of spending: specifically, spending for "post-acute care"--that is, the follow-up care after hospitalization--and most of the rest of the variation is due to variation in acute (inpatient) care. These findings for Medicare are representative of a large literature showing that patterns of U.S. health care for all age groups vary considerably across cities and states. For example, the decision between heart surgery and treatment with blood pressure medications, or the proportion of mothers who have a C-section, or the choices about all kinds of minor surgery vary considerably across locations. There is often with no evidence that the area making the more expensive choice has better health outcomes, which suggests that if health providers in some areas could learn from those in other areas--or if health care reimbursement plans can be jiggered to reward certain choices and discourage others--overall health care costs could be reduced with little or no adverse effect on health. But not much is known along these lines so far. As the Institute of Medicine report notes, "By creating the Center for Medicare and Medicaid Innovation, the ACA [Affordable Care Act] generated a thousand pilot demonstrations of new payment models. It is too early to know which of these models will prove to control health care costs and improve quality." Also, the author suggest: "Additionally, Congress should give CMS [Centers for Medicare and Medicaid Services] the flexibility to experiment with the mix of payment mechanisms, rates, and performance metrics that will align provider incentives with high-value care." Given that rising health care costs and the geographic variations in health care use have both been well-known for several decades, the fact that experimentation with different payment methods "to align provider incentive with high-value care" is really just getting underway seems to me rather disheartening. turnover in April 2013: preliminary global results," has some familiar news. Foreign exchange markets are extraordinarily large. "Trading in foreign exchange markets averaged $5.3 trillion per day in April 2013. This is up from $4.0 trillion in April 2010 and $3.3 trillion in April 2007." The growth rate of the foreign exchange market in recent years has been about 35% annually. What accounts for this very large total? In round numbers, world GDP is about $70 trillion, and world exports are about 30% of that amount--call it $21 trillion per year. Clearly, foreign exchange markets are not mainly driven by the direct needs of exchanging currency for exports and imports. Flows of foreign direct investment around the world were about $1.3 trillion in 2012. Total global holdings of portfolio investment were about $39 trillion in 2011. Thus, it doesn't seem that the need to exchange currency for either foreign direct investment or for portfolio investment can explain what's happening in foreign exchange markets, either. The remaining possible explanation is that the enormous size of exchange rate market arises primarily out of short-term decisions about hedging risk and seeking return in a global economy, where many financial and nonfinancial firms are continually adjusting their exposure to the possibilities of future movements in exchange rates. Another main message of the BIS report concerns the role of the U.S. dollar in foreign exchange markets. It continues to be true, as it has been for decades, that many foreign exchange trades between currencies A and B involve first turning a currency into U.S. dollars, and then switching to the other currency. "The US dollar remained the dominant vehicle currency; it was on one side of 87% of all trades in April 2013. The euro was the second most traded currency, but its share fell to 33% in April 2013 from 39% in April 2010. The turnover of the Japanese yen increased significantly between the 2010 and 2013 surveys. So too did that of several emerging market currencies, and the Mexican peso and Chinese renminbi entered the list of the top 10 most traded currencies." I'll attach a list of currencies, in the order they are traded in foreign exchange markets. Of course, the report has more details about changes since the first survey in 1998, as well as the specific financial instruments used. in Combating Youth Unemployment in Europe and the United States," written as Policy Brief PB13-20 (August 2013) for the Peterson Institute for International Economics. As a starting point, here's a graph showing what share of students age 15-19 are in apprenticeship programs in EU countries. 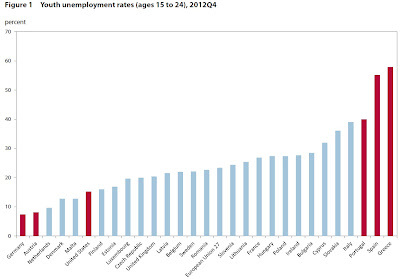 In Austria and Denmark, it's more than one-quarter; in Germany, it's more than one-third. And it's worth emphasizing that this measure of apprenticeships tends to understate what overall share of the population had an apprenticeship at some point in time; for example, a 15 year-old may not have an apprenticeship now, but might have one in the next year or two. This EU data doesn't include estimates for the United States, but a recent OECD report called "A Skills beyond School Review of the United States," by Małgorzata Kuczera and Simon Field, offers some information on the US situation. high level skills such as health care and IT." For some sense of the promise of internships, look at unemployment rates for younger people in the 15-24 across a number of countries. 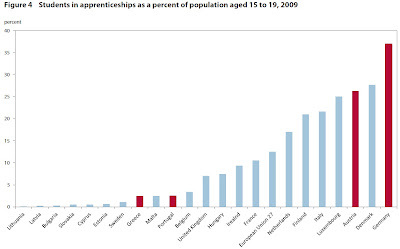 Of course, the lack of apprenticeships isn't the only reason, nor even close to the main reason, that youth unemployment is above 50% in Spain and Greece. But it's nonetheless intriguing that the countries with the lowest youth unemployment rates tend to be those with the highest share of apprenticeships. "To implement successful apprenticeship programs, governments should pass legislation to create nationally recognized apprenticeship-completion certifi cates as well as regulate apprenticeship content to ensure quality and transferability of skills. Apprentices should be given a stipend (typically one-third to one-half of the wage of a regular employee in that sector) and other benefits such as health insurance. ... Critical to the success of apprenticeships is participation of labor unions and private businesses. To attract firms they must be given considerable autonomy in developing the on-the-job training components of apprenticeships. If necessary, firms can also be offered tax incentives and training subsidies." For previous posts on apprenticeships, see "Taking Apprenticeships Seriously" (February 18, 2013) and "Apprenticeships for the US Economy" (October 18, 2011). Jessie Romero has an "Interview" with John Haltiwanger published in Econ Focus, a publication of the Federal Reserve Bank of Richmond (Second Quarter 2013, pp. 30-34). So Steve and I called up the Census Bureau. Robert McGuckin, the director of the Bureau’s Center for Economic Studies (CES) at the time, invited us to come give a seminar. We got two reactions. Bob McGuckin was incredibly enthusiastic. But some of the folks said, “You guys are nuts!” They kept saying that the data were not intended for this task, that we were pushing them in a way they weren’t meant to be pushed. Steve and I were cognizant of that, but we started working with the data and realized their potential, and that led to us developing these concepts of job creation and destruction and how to measure them. Over the years, one of our most satisfying accomplishments was to convince the statistical agencies that this was important. The Census Bureau and the Bureau of Labor Statistics (BLS) now have regular programs where they are turning out the kind of statistics that we developed. Back in the 1980s, there were only a handful of people working with the firm-level data. We literally were in basement rooms without windows. Now the CES has 100 staff members and 15 research data centers spread across the country — and most of the staff work in rooms that have windows!" change the way that you screen workers — these are just two examples of the variety of margins that a firm can use. As shorthand, we’ve called these margins “recruiting intensity.” We also found that recruiting intensity dropped substantially in the Great Recession and has been slow to recover." I think lots of countries hear this advice from economists or from organizations like the International Monetary Fund or the World Bank, so they open up their markets, they open up to trade, they liberalize their labor and product and credit markets. And what happens is, job destruction goes up immediately, but job creation doesn’t. They realize that they’ve got a whole bunch of firms that can’t compete internationally, and they’re in trouble. ... On the one hand, there is lots of evidence that countries that distort the destruction margin find themselves highly misallocated, with low productivity and low job growth. On the other hand, it’s difficult to just let things go without having well-functioning market institutions in place ..."
We’ve been struck by how rare success is for young businesses. When you look at normal times, the fraction of young small businesses that are growing rapidly is very small. But the high-growth firms are growing very rapidly and contribute substantially to overall job creation. If you look at young small businesses, or just young businesses period, the 90th percentile growth rate is incredibly high. 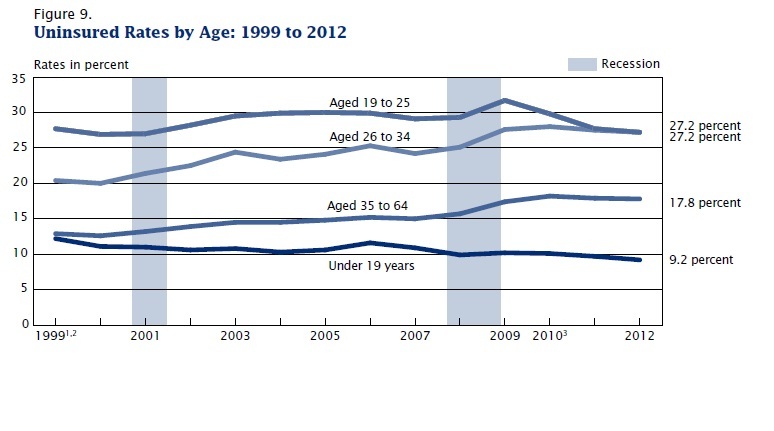 Young businesses not only are volatile, but their growth rates also are tremendously skewed. It’s rare to have a young business take off, but those that do add lots of jobs and contribute a lot to productivity growth. We have found that startups together with high-growth firms, which are disproportionately young, account for roughly 70 percent of overall job creation in the United States. The labor share of national income is falling, both in the U.S. (see here and here) and around the world (see here and here). One useful way to gain understanding on this issue is to break down the different components of labor and capital income and see what's driving the change. The Congressional Budget Office provides a useful overview of this approach with U.S. data in its July 2013 report, "How CBO Projects Income." Here's a figure showing the labor share of income for the U.S. economy as a whole, as well as for as for the business sector as a whole and the corporate sector (that is, businesses that are officially incorporated). As I've noted before, back around 1980 when I was first getting my feet wet in economic data, the standard line belief was that the labor share of income was roughly constant. Even into the 1980s and 1990s, one could argue that the labor share of income was hovering in more-or-less the same fairly narrow range. But the fairly drop in labor share of income since about 2000, down to 59.3% of total income in 2011, is below any post-1950 value. 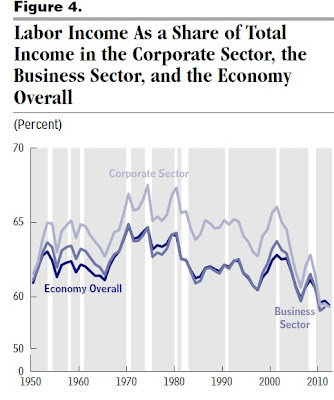 The figure also shows that the big drop in labor's share of income has occurred in the corporate sector. Why has the fall been so large in recent years? Clearly, the depth of the Great Recession and the sluggishness of the economy since the end of the recession in 2009 make a difference to what labor is receiving. The typical pattern is is that labor income tends to rebound as an economy recovers, but the recovery has been so listless that labor's share has stayed low. "For example, technological change may have reduced the returns to labor relative to capital in several ways: By expanding options for employing capital in place of labor (such as through automation); By reducing the relative price of capital goods, especially those used for communications and information processing; and By increasing the pace at which skills tied to old technologies become obsolete, thereby reducing the productivity of workers whose skills are not up to date. Moreover, technological change has increasingly contributed to the globalization of markets for services as well as for goods. At the same time, globalization of labor and product markets may have increased the returns to capital relative to labor by enabling the United States to specialize in the production of goods and services that require the capital inputs that it has in abundance relative to most other countries.Globalization may have also eroded the bargaining power of workers by increasing the mobility of capital. Here are a few other aspects to the labor-share-of-income story. One is that the roughly constant labor share of income from 1950 to about 2000 may be a bit misleading in some ways, because it was actually made up of some offsetting trends. The relative stability of the overall labor share between 1950 and 2000 reflected in large part the offsetting effects of changes in the sectoral composition of the economy. Expansion of the nonprofit sector, which includes most hospitals, for example, put upward pressure on the labor share because that sector is labor-intensive and has a high labor share of income. 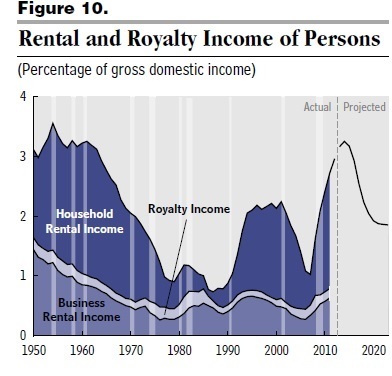 In contrast, growth of income generated by owner-occupied housing, which represents the bulk of income generated by the household sector, increased the income going to capital and put downward pressure on the labor share of income. As the second arguments here notes, the drop in labor income as a share of GDP can also be viewed as a rise in capital income as a share of GDP. Moreover, in the economic statistics behind these calculations, owner-occupied homes are treated as if they were rental businesses, with those who own the home acting as "landlords" who rent the home to themselves. The value of living in the home that you own (which is estimated or "imputed" by the government statisticians) is treated as capital income.As CBO explains: "That imputed net rental income is recorded in the NIPAs [National Income and Product Accounts] as the difference between the value generated from housing services and expenses such as mortgage interest, maintenance and repairs, property insurance premiums, property taxes, and depreciation." has grown as a share of GDI since the mid-1970s, largely as a result of the shift in investment spending toward assets with shorter service lives (especially computers, communications equipment, and software) and thus higher rates of depreciation." Again, this factor can help to explain why the capital share of total income is larger and the labor share of income is correspondingly smaller. Finally, a big share of capital income is profits to firms. 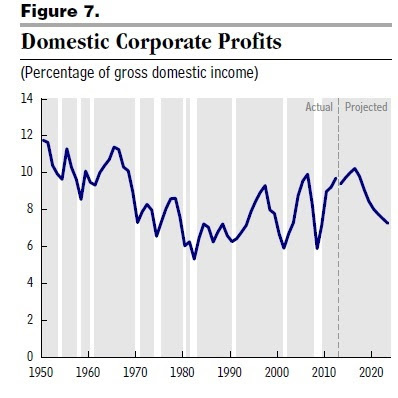 Profits fluctuate a lot year to year, but if you squint a bit at this figure, it looks as if there is an overall downward tend in profits from the 1950s to the 1970s, and then an upward trend in profits since then. Of course, higher profits being earned by firms can also be explained to some extent by the opportunities opened up by technology and globalization discussed earlier. From all of this, here are a few take-away thoughts: The labor share of income in the U.S. economy is historically low. Some of this will self-correct as employment gradually rises again. Some of it is due to change in technology and globalization that have raised the return to capital and put downward pressure on the pay of substantial groups of workers. Some of the fall in labor's share of income is due, in a statistical sense, to less-discussed factors affecting capital income like a rise in recent decades in the value of living in a home that you own, and to the fact that capital investment in information technology has a shorter life and depreciates faster than past capital investment.